Hi I am currently building the skerry and considering putting some buoyancy under the seating, this is my first build. Is buoyancy necessary ? And if so what is the best vfm option? Theoretically you don't need buoyancy as these should be sealed 'tanks' but I'm a belt and braces sort of guy when it comes my own epoxying and boats that'll capsize so my 'tanks' are filled with chopped up swimming noodles. The Skerry has capsized. It didn't sink not even full of water just below the centre seat and with me in it bailing. I can't say if that would have been the case without the chopped noodles and I'm not prepared to try but as I said theoretically . . . There should be sufficient buoyancy without filling the tanks with foam. I can confirm that the boat in the video did not have anything other than air in the tanks. However, there is nothing wrong with a belt and braces approach. The Lutra laker has several water tight storage compartments but I wanted to seal off some of these completely to ensure buoyancy. I was concerned that these sealed compartments might be affected as the air contained expanded or contracted with temperature changes. The cheapest option I've seen is empty milk cartons or plastic lemonade bottles wedged in wherever they fit. The problem of air expansion in a buoyancy compartment is easily resolved by fitting Fyne Boats drain plugs but install them close to the top of the compartment wall so they then act as vent plugs. I used them on my first boat which was an Eastport Pram. Obviously this doesn't help if the buoyancy chamber is penetrated by running aground or collision. I did consider just drilling small vent holes near the top but did not know about or consider vent plugs. I like the rigid foam. It solved my air expansion problem and I feel more comfortable knowing that the section most likely to suffer impact (lower bow) has additional support. In reality impact damage is unlikely as I don't go charging around in shallow water where there are large rocks around. The other aspect I liked about the foam was the prevention of any condensation build up. Again I'm not sure how big a problem that is in reality. The downside of the foam is that it is adding a little more weight. Not much and not really a concern for me as my boat is on a trailer but if you are car topping then the less weight you add the better. I have heard stories about tanks exploding but I have not actually talked to anyone who has had it happen. But there is no doubt that the tanks do expand if ashore in the sun without removing the plug or hatch. These are the vents I have Drain Plugs but I did see some very attractive ones for surfboards somewhere on the fyne syte. I fitted the drain/vent plugs in my Skerry. I've had no problems at all here, even through August with temperatures in the high 40s°C. I don't always remember to open and close them either! I think the expression 'exploding'is probably OTT - but I guess there is a risk that repeated cycles of heating and cooling might lead to cracked epoxy glued joints. The subject of buoyancy is now high on my agenda having conducted an unplanned buoyancy test on my Skerry yesterday. Yesterday was a very breezy day down here in Devon, blowing a force 4 out on the river (white caps) but the weather was fine. There was less wind on the western shore in the lee of the club, so I hoped some pootling would be possible. My decision to go out was clouded by the fact that it was the last opportunity to go for a sail form some time with other commitments next weekend, work trips, holidays etc..so I set off. If my decision to set sail at all was a bad one, this was confirmed when i got half way out. It was very gusty, very choppy and generally far from pleasant. I had no crew with me and so making the adjustments to try trim the sail and the boat in the heftier wind was a lot harder (doh!). I made the decision to head for home, but as I cam about a gust of wind caught the boom. The boom swang quickly and biffed me on the nose, knocking me for six and over we went. Poor seamanship all round! Anyway, righting the boat was easy, but I needed to lower the main while floating beside her in the water. The buoyancy tanks were holding her afloat easily - which was very pleasing. The next issue was bailing he out. However, I could not get back in the boat without her tipping further over and adding more water to the problem. Fortunately the club saftey boat was on hand and we recovered the boat quite easily. They were more concerned with the blood streaming from my nose, while I was naturally only worried about the boat! We heaved her up onto the side of the rib to bail her and then towed her back to shore. Although I am pleased that the boat floated, I do need to work out how to be able to recover when there is not help at hand. When swamped the skerry sits very low in the water with very little freeboard. The buoyancy, while quite sufficient to stop her sinking, is not sufficient to raise her above the level of the dagger board slot to allow more water to drain out. I think some extra buoyancy bags strapped below the central seat might be the answer. There is plenty of width there, but not a lot of depth to strap anything. There are long buoyancy bags available, but the narrowest I have found is about 6 inches which will poke out from under the seat. There is a large hole in the central thwart in the Skerry design so it may be possible to strap two squarish bags below the seats running laterally. Somethign like this may work. http://www.fyneboatkits.co.uk/accessori … dle-float/ These may also be useful to help right the boat too to give her more stability when clambering aboard. I have also been thinking about added some lateral seating running aft from the central seat to give a better helming position when sailing single handed. This would afford more buoyancy stowage. When we did finally get the boat ashore (and I am grateful to all my fellow club members for helping! ), I noticed that there was some water in the buoyancy tanks. I need to check the seals on these and probably add a squeeze of silicone to ensure that no water can penetrate. I have also been told that vasseline on the hatch closure is a handy trick, but I am tempted to add some kayak buoyancy bags inside the lockers just for a belt and braces approach to the issue. Anyway, valuable lessons have been learned, but I recommend a more controlled buoyancy test if anyone else is planning to give it a go! If anyone sees a pink cap floating off to France, can I have it back? Nothing like a good unplanned buoyancy test! I was a little chagrined at Easter when my son, paddling my Aleutesque kayak, came up looking a little unhappy and with a very definite nose-down attitude, with 2 km of an 8 km crossing still to go in force 4 gusting 5. It turned out I had left out the seal on the front hatch! Still, even loaded with about 30kg of supplies and my 70kg son and the bow compartment flooded completely, it still floated. I have been tinkering on the boat this afternoon and put some more silicon around the hatches and over the screw heads that hold the hatches in place. 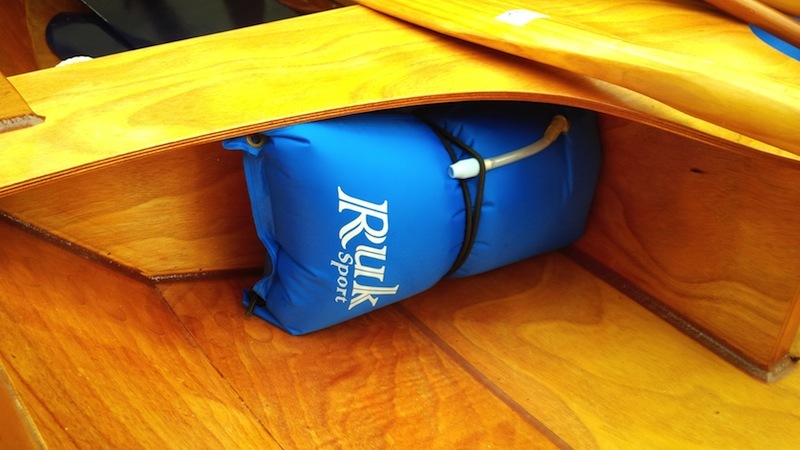 I have also attached two Ruk Paddle floats either side of the dagger board case, under the central seat to act as some extra buoyancy for the boat. I am hoping that this belt and braces approach will give the boat a little more lift & freboard if she becomes swamped. Not a pretty solution, but hopefully effective.